It's been non-stop parties for the Kardashians recently! After throwing a cherry blossom-themed shower for baby No. 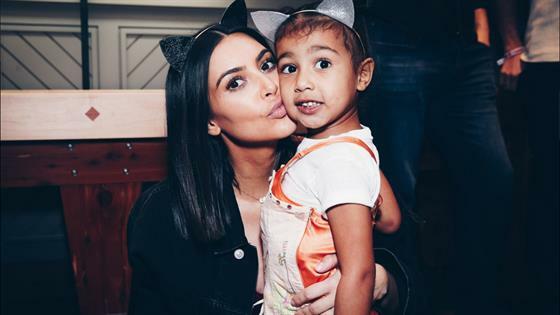 3 last month, Kim Kardashian and the fam had a "Monster Mash"-themed second birthday Sunday for Saint West, who turns 2 years old Tuesday, and Kourtney Kardashian's son Reign Disick, who turns 3 years old Dec. 14. Kim took to Snapchat to share images from the fun-filled and festive afternoon of activities, filled with ice skating, tubing, and a visit from Santa Claus—fake snow and all. The get-together even featured elaborate and individual Monsters, Inc. birthday cakes for each boy. Saint's cake had Mike Wazowski on it, while Reign's cake had the James P. Sullivan character fixed atop of it. Too sweet! The kiddos get their skate on and the wintery bash on Sunday night. Old St. Nick appears to be hanging out in the sun and fun of California. The fam had an icy time using candy-shaped inner tubes for sledding. Kim posts a photo of the boys' Monsters Inc. birthday desserts from Hansen's Cakes. Members of the fam get their skate on during the bash. It's a "Merry Monster Mash" for Reign and Saint!